Edited for 2007 NCCC/RMR Rules and Expanded by Mike Konshak. A more technical driving course. lot, or airport apron or runway. autocrosses or driving schools (NCCC or SCCA) during the past 24 months. to teach car control to young drivers in a safe environment. rating of 160, tires and wheels must be stock size. that fit without touching frame or body at anytime. meet NCCC rulebook safety tech for Group 3 cars. 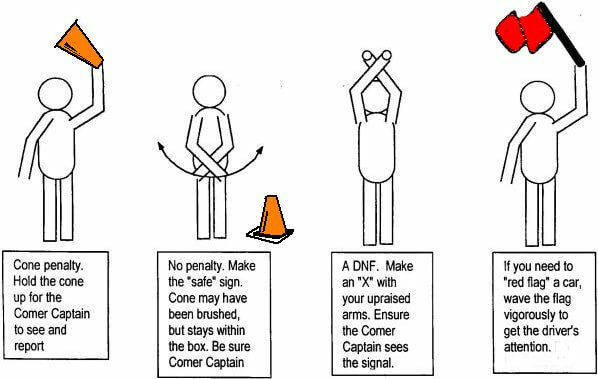 spelled out in the NCCC and RMR rule book. Schools with a follow-on autocross the same day. part of the sport, and it’s why we all do this. Regional and National Champions, had a first day and a novice season. you’re going “slow”, it’s still fun driving. competitor to see the course at speed). Your goal is to have fun! That’s why everyone is here. (anybody!) and continue to make each run faster than the last. you’ll soon be winning trophies. a Solo event, but this will get you started. 0-9.pdf Courtesy of Rocky Mountain Solo SCCA. to approximately 40psi all around. this to compete, and any guests you bring must sign the waivers also. the window, or use magnetic numbers if you have them. leaving the keys in the ignition and your helmets on the roof/seat/trunk. of loose items or hub caps if you’ve forgotten. Click for larger After tech, you will have time to walk the course. or confused during your first run. You will have a minimum of three timed runs, weather permitting. too near the car already on course. participants, volunteer early on and readily accept assignments if asked. announced in the drivers’ meeting. if you knock them over. in fifteen to twenty minutes. will give out results and present trophies (if available or requested). the more serious competitors, rather than trophies. years from date of manufacture. Solidly Mounted Battery: The battery must be held down properly. battery requirements which may affect you if you have modified your car. The Tech Inspector will help you out with them. should be higher than used for the street, usually 38-40 psi on all tires. excessive play. Wheel bearings cannot have excessive play. favor of stick-on or paper numbers. it must pass tech inspection. Know your area of responsibility and station location. and check them periodically during your shift. themselves to see the wobbling cone which may have left the box. 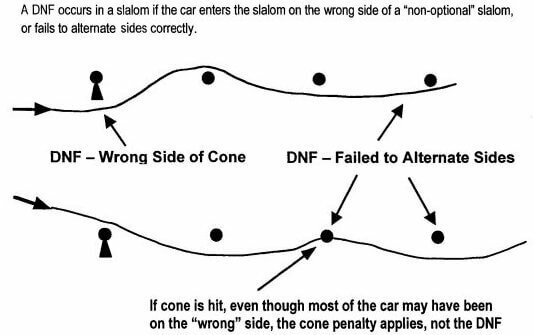 pass on the wrong side of a cone. once you get a wave of acknowledgement from the official. coming through in as soon as 30 seconds. if it is an emergency. However, if in doubt, err on the side of safety! to compensate, so keep using the chalk at every event. the lock on the reel. impact on your driving skill. you can’t, then you can’t drive it to its fullest potential”. will look like at speed. make notes such as pavement changes, camber change, bumps, sand, etc. Four-time SCCA Pro Solo and Solo II National Champ. should not be spending any time figuring out where the course is. you did this step correctly, but step 4 is something you can work on. possible, or try to carry speed through to keep up the revs. Step 4) After the run. Sit in your car and go over your run. the plan correctly, and a red light should have gone off in your head. better execution of the plan, or a modification of the plan. difference in your times when you drive a course that never surprised you. whole list, then work at gaining these skills one at a time. lights so you want to be accelerating as you pass through them. debris (She’ll give you more room next time). do this all the way through a course. in the slow spots. They’re slow spots, after all. Brake hard in corners. Go ahead, squeeze the brakes hard. let them do the work, not your tires. happens when you ask for more traction by applying the brakes? this is true in your region). advanced techniques of heel/toe, shuffle steer, late apex, and more. quicker time at the next NCCC/RMR autocross. nothing is less expensive in improving your times. time, and tell you what needs changing. They’ll be glad to. probably going over their run or plan. tires. Not a bad price for a private instructor all day! possible. You’ll then be repaying the favor to the next novice. ideas to lend a hand. up, to cheer the winners, even if you didn’t get a trophy yourself. you about legal modifications, rules on re-runs, and many other topics. You may look through the region’s copy to see what’s there. your local NCCC club and go to as many events as possible. receiving a trophy or not. forget to check when and where the next Autocross will be held! driving for Autocross, where it’s legal!